Memphis is a city loaded with musical history, and as a result, if you want to immerse yourself in our musical past, you’ve got plenty of options. There are musical landmarks all over the city, great record stores, and fantastic music-related museums and attractions. The thing is, in a city with so many options, it can be tough to know where to start. The Rock’n’Soul Museum is a great place to get a fairly complete overview of Memphis music. The tour of the museum takes you through the rural south of the Great Depression, a place where Southerners both black and white worked hard on their farms and enjoyed religious music, radio dramas and mail-order records played on Victorolas. 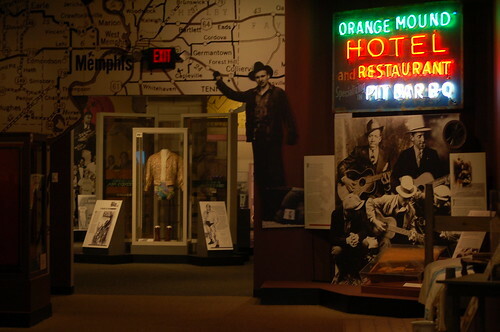 From there, the museum winds through the story of the way that gospel and country music came together to birth rock’n’roll and soul music without skipping any of the important parts. All of Memphis’s major history-making record labels are represented, including Ardent Records. There’s a special Box Tops / Big Star area towards the end of the museum as well as a special exhibit about Ardent Records’ contributions to music. Inside the Rock’n’Soul Museum, Memphis, Tenn.
Because the Rock’n’Soul Museum is affiliated with the Smithsonian Institution and located in Memphis (a city where people seem to hang on to everything), the collection of artifacts, clothing, recording equipment, photos, signs, and video. There are microphones from WHER (Memphis’s only all-lady radio station) and WDIA, one of Sputnik Monroe’s wrestling costumes, the bandstand from American Bandstand, and an original “I am a man” poster from the civil rights movement. 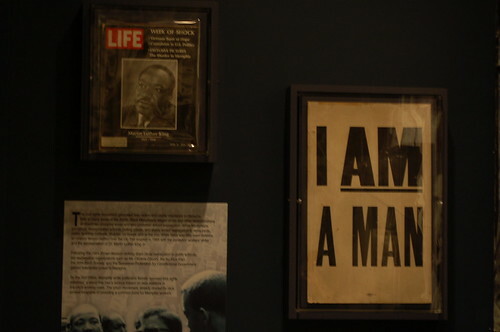 An original “I am a man” poster at the Rock’n’Soul Musuem, Memphis, Tenn. If you don’t have time to see everything musical in Memphis, you should make a point to spend a little time at the Rock ’n’ Soul Museum. The museum is easy to get to and the tour lasts about an hour. Admission is $12.50 for adults and $9.50 for kids. Kids under 4 are free. Hi, I traveled to Memphis in August 2007 to attend the Elvis Week. In my last day in Memphis I visited the Rock’n’Soul Museum and… my God! what a fantastic place is that? I loved everything, I felt as if I were there in each moment of time they show. I just think, as a suggestion to attract more foregneir visitors, they could have individual translation equipment to other language just like they do at Graceland. But this is certainly a place I’ll visit again when I return to Memphis one day. Congratulations for your blog, simply loved. I’ll link yours in mine portuguese blog called Aloha Brasil, ok?Bye of a friend from Brazil. Love the Rock N Soul Museum!!!! I went there for the first time yesterday with my mom. I loved it. I’ve wanted to go for years now but I haven’t ever had the time. I believe only in Memphis will you see a museum with a Led Zepplin album and the Hustle and Flow soundtrack right beside eachother.